The entire point of today’s post is to entice you to run out to the farmers market and scoop up a final case of late-September peaches. Are you convinced? Because this weekend we are making jam, probably for the last time this summer. Saffron Peach Jam. Yes, it’s as intriguing as it sounds. Yes, you will want to cook along. And yes, a side benefit of having peaches in the house is that you can eat them on ricotta-slathered toast for breakfast. 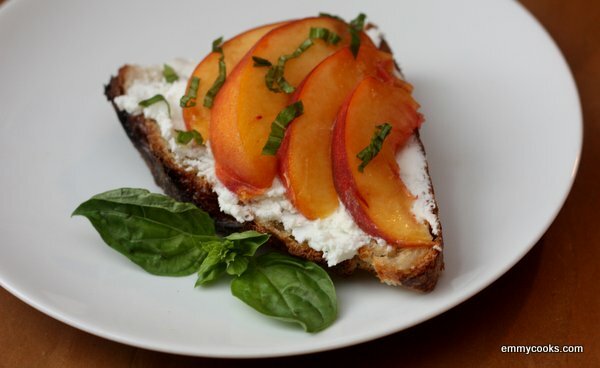 Peach and Ricotta Crostini with Basil: Slice peaches. Eat them on ricotta-slathered toast for breakfast. Or anytime, really. Basil slivers on top are nice, too. I’ve just been given a bag of late season peaches and I’m thinking crostini already. That photo makes me want to run to the farmer’s market now…Beautiful! This looks like the perfect end of summer treat!! Yum! That looks AMAZING, Emmy! Can’t wait to see the saffron peach jam. I love saffron and have never had it with peaches; I imagine that it is delicious though. I am slobbering at the photo. We bought some chevre at the farmers’ market (for my lacto devouring daughter) and I can only imagine how this would taste in your recipe. Yum. This goes to show that simple is best! Yum! I love this combo! I made a pizza with nectarines, basil, & balsamic earlier in the summer & this makes me want to make it again with peaches!